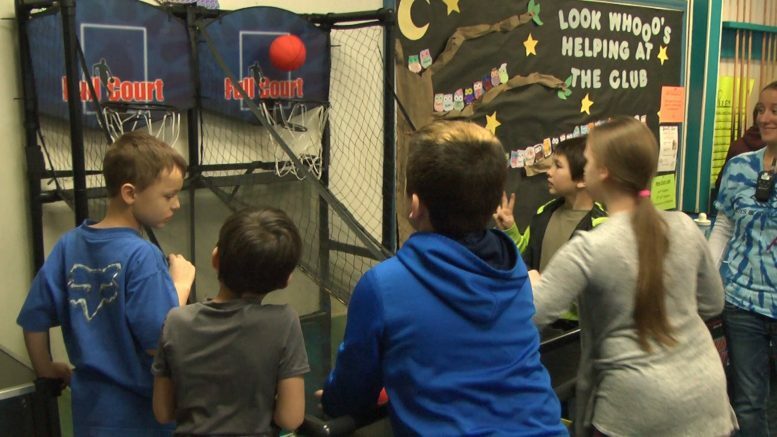 (Photo Courtesy/Mike Beiermeister) A group of kids play pop-a-shot at the Boys & Girls Club in Alpena. Alpena, Mich. — Area schools were closed today. It’s the third day in a row that schools have kept their doors closed due to the extremely cold weather. That didn’t keep all kids from staying in their homes and getting cabin fever. The Boys & Girls Club of Alpena welcomed children in from these frigid conditions. Children played pop–a–shot, pool, and participated in obstacle courses. Plenty of activities were scheduled throughout the day to keep the kids engaged. Children like William O’Neill and Emma Jo Kruccynski enjoyed heading to the club today. “It keeps me entertained, and a lot of my friends come here,” said Kruccynski. During these conditions, it can be hard for children to stay active, but that was not the case today for all the kids in attendance. “Rather than staying home and watching TV, I could come here and go to the gym and play basketball, have some activities to do,” said O’Neill. Children can also get help with homework, grab a meal, and just have fun being a kid. With schools already canceling Thursday, more children can expect to stretch their legs and have fun at the Boys & Girls Club. “I was pretty happy because the past two days, they’ve [Boys & Girls Club] been closed, and there is really nothing else to do except just sit inside and watch TV because it’s so cold out,” said O’Neill. For more information, visit their website www.bgcalpena.org.